Tim McGraw is on top of the world; he’s happy, healthy, and has a wildly successful career. However, the 47-year old got candid in the new issue of Men’s Health, detailing his battle with addiction and what finally made him get sober. “I partied too much. And did other things too much. Chemically. No needles or that kind of stuff, but … use your imagination,” the country music superstar told Men’s Health. 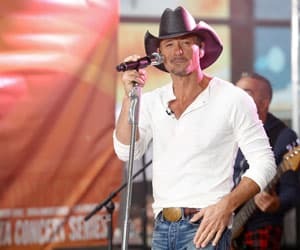 McGraw admits he drank on a regular basis and performed most of his shows while drunk on whiskey. After that first drink, control and moderation went out the window. McGraw’s wife, Faith Hill, is a country music icon in her own right and mother to the couple’s three daughters. Though she initially tolerated her husband’s alcoholism, Hill finally had enough and presented him with an ultimatum: get clean or lose your family. Similar to fellow country music star Keith Urban’s story of sobriety, McGraw also credits his wife for saving him from certain death. In a 2009 interview with People magazine, he admits he probably wouldn’t have gone to rehab had it not been for Hill. Sober since 2008, McGraw is now focused on his health. The proof of his dedication to fitness can be seen in this month’s Men’s Health photo spread. At the age of 47, McGraw has washboard abs that won’t quit and a physique most men could only dream of. When asked the secrets of his fitness success, he credits a specially created diet made to boost energy and a rigid training routine. McGraw works out three times a day for up to 90-minutes each session.